In yesterday’s post about Android 5.1 R3 update, I mentioned we were just about go out on a one day trip. This trip was to the Shinjuku Gyoen Park in, well, Shinjuku, to see Cherry Blossoms. This is my second visit, but for my wife and kid, this is their first visit. Part of the 2011 company get together – the event part – was held there. Before heading there, we weren’t sure if Sakura was at full bloom. I’m sure there are websites that report about the current state, but I couldn’t find any concrete information about it. So we had to make a guess based on the information presented on this website. We hadn’t made a mistake. In most parts of the park, the Sakura trees were in full bloom. Of course there were many trees that had flower buds that were only starting to bloom. The peak probably would be around the middle of the next week. But we won’t be able to visit there during that time, because of work. But we might visit another Sakura sightseeing area in the next weekend as well, just to see if we can gain an even better experience. Several months ago, I shrunk down my desktop PC from a case with with 69 litre volume to a measly 23 litre one. The main reason for doing that was to move the PC off the carpet and on to the desk, so that my kid doesn't get access to all the wires dangling from the back of the case. (No, I won't get an iMac instead.) It'll be a couple years before he'll be able to access them with the current arrangement, so it'll do just fine until I leave Japan for good. Just be clear that this was not something I wanted to do, rather a necessity. Would I have shrunken the PC if it wasn't for this particular reason? There is another reason for making the PC smaller, but I'm not sure about the timing. I intend to ship the PC back to my country when I leave Japan, thus the volume would be a primary concern. Of course, I would be shipping the PC (that's my precious) and if I had the Raven RV03 with me, that would have used up too much space, which could otherwise be used for other stuff. But still, pure usage wise, has shrinking the PC caused any hindrance? There are few issues that were definitely caused by the lack of space inside the small case. Having space for only two hard drives, ironically, isn't one of them. To be frank, having just two hard drives makes organizing data easier for me. One for the data and the other one for the backup of the first drive. In addition to those two 3.5 inch hard drives, 6 SSDs can be installed as well. With the prices of SSDs dropping, the case seems to be suited for the future. The two biggest issues I'm facing are the inability to install a large CPU cooler and the uncertainty of the upcoming R9 390x WCE's radiator fitting the rear 120mm fan bracket. This is not a tech post. Luckily for me, I still haven't required to collect that chit during the entire almost-5-years that I've been in Japan. That is not to say that there haven't been delays, but in all those occasions, I've managed to get to the workplace in time. It usually takes about 15 minutes to get from the station to the current office, however once I was forced to get there in just 8 minutes which I managed without much issue. Of course I had to run. At the beginning, I used to take the 7:35am train bound for Kawasaki. This got me to work way too early. I was at my seat by 8:10am, by walking as slowly as I could to the office from the station. We don't get paid for starting working before 8:30am, so that was highly inefficient. I changed to the 7:45am train and now I take the 7:52am one. But on most days, I miss the 7:52am train and have to go by the 7:55am or 7:57am train. 7:57 train is dangerous because if there is a 10 minute delay, I'm screwed. 7:55 one is OK as it gives me 18 minutes to walk from the station to the office, if the trains are on time. In a previous post I wrote that Google released the Lollipop 5.1 firmware update for the Nexus 5 and that I was in a dilemma whether or not to perform the manual upgrade. I further said that I would do it during the weekend if I made up my mind to go through with it so that I would be able to troubleshoot if it would deem necessary. Well, I couldn't resist. I decided to update manually on the next day. Regardless, I decided to go ahead with the flashing. I moved all the user data (photos, music and PDF files) to my PC first, and downloaded the Hammerhead 5.1 firmware from official Google servers. Then I followed my trusty YouTube tutorial, the one that I followed when upgrading to 5.0 as it was still applicable. I had the boot loader unlocked from the last time so I didn't have to unlock it again. And I kept it unlocked after the flash, which went fine without any issues (phew). I didn't see a reason to lock it back. Is there any? I actually forgot to talk about how well my Gigabyte GTX 970 Gaming G1 card overclocked. If you had been following my posts regularly, you might remember that this is not my first GTX 970 card. Not even the second. This is the third. I had two MSI GTX 970 Gaming cards prior to this one, which were both returned because of the presence of significant coil whining in the first one and one of the two fans not spinning – thus overheating – in the second one. I paid a tad bit more and got the Gigabyte card, which has been performing much better in terms of peak temperature while gaming and how high of an overclock it could sustain while gaming for hours. This post is about the overclock I was able to achieve with the Gaming G1 card. Overclocking was performed by directly modifying the BIOS. I didn't use any software such as MSI Afterburner because I wanted to stop the clock fluctuations due to the presence of Turbo Boost and game at the maximum clocks at all times. Then it would be easier to detect instabilities. There is a JVP way you can achieve this by modifying the firmware binary file, which is discussed here and the flashing guide here. Furthermore, as this card has an excellent cooler, i Increased the GPU voltage to 1.25V from the stock 1.212V (as I recall), however the gains are usually marginal. First of all, I tried to see how far I could push the core clocks – which matter more than the memory clocks – while keeping the memory at stock 7GHz. I took it slowly, because I was flashing the BIOS every time. I was able to hit a little over 1600MHz, which was about 100MHz more than I could hit with the MSI card. It was fairly stable, but Crysis 3 - my favourite game - wasn’t all that happy with those clocks. It would run without any issues for a couple of days, but then crash abruptly. I had to drop the clocks to around 1585MHz to get it stable. Couple of weeks ago I bought my first mobile battery charger – the Jackery Zen – and I'm thinking about returning it. This is because it doesn't work as intended for me. There are few issues and one of them is a deal breaker. I bought the charger to charge, not only my Nexus 5 phone, but also my Plantronics BackBeat Go 2 Bluetooth headset. This charger is incapable of "normally" charging the headset. When the headset is plugged in, it would start charging, but it would stop charging momentarily. This is probably because the current draw is too low for the charger to detect that there is a device plugged into one of its ports. It works with neither of the two ports. Why I said that it cannot "normally" charge is because there is a way you can get it to work and that is by charging it together with the phone. Then it would not shut-off because the phone is draining the battery faster. I'm not sure if this is by design or there is a defect in my particular sample, but I sure am disappointed. The next issue is that the charging USB cable that came bundled with the charger doesn't fit the headset tightly. It's loose and comes off easily, although the cheapo cable I bought from the 100 Yen ship works perfectly. Of course you have to charge both the phone and the headset simultaneously. 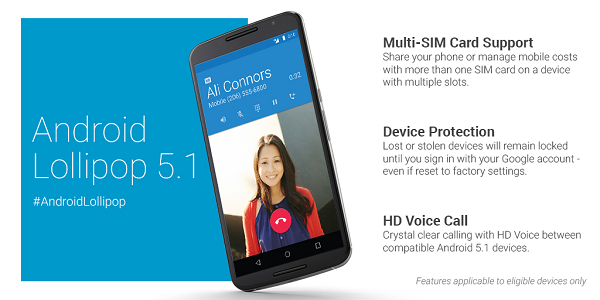 To manually upgrade the Nexus 5 to Lollipop 5.1 or not? Today Google officially released the Lollipop 5.1 firmware builds for the Nexus 5, Nexus 7(2012) and Nexus 10 devices. Of course the over the air (OTA) updates aren't here yet, but what's funny is that the flagship Nexus 6 and Nexus 9 devices have gotten the mother-in-law treatment. The update is not available for those two devices yet. That's certainly messed up but I don't care as long as I can get it on my Nexus 5. You can get the latest official firmware for the Nexus devices from the following link. Now, I'm in dilemma whether to manually upgrade to 5.1 or wait for the OTA. OTA is safer and easier, because it needs just a tap of a button, but nobody knows how long it will take for it to show up in the available updates. Lollipop took about 3 months, which is outrageous. Funnily, my wife's phone got the Lollipop update just one day after I went through the process of upgrading manually. Maybe I will give it a shot; perhaps in the weekend because then I have time to figure things out if I mess up something. But I hope that I will not have to face any issues. I bought my last SSD in December 2012, which is a long time for me to go without an upgrade. There are many valid reasons for holding off the upgrade. Firstly, the SSD prices haven't come down as much as I expected in the last 3 years. There was a huge drop in price before 2012, annually. Conversely, the Japanese Yen has gotten weaker in the last couple of years. The overall effect of this has been such that a 250GB SSD nowadays is more expensive (JPY 15,220 for Samsung 850 Evo as of today) than what I paid for (JPY13,800) my Samsung 840 250GB in 2012. So my reluctance is natural. Secondly, even though the benchmark applications may be able to differentiate SSDs by their performance, it is almost impossible to do so while actually using it. All SSDs feel fast. Sure you might be able to launch applications milliseconds earlier than others with a faster and more expensive SSD, but that's hardly something that can force someone to upgrade. My work computer is very slow and I suppose most of the time that's the case. I blame three things for my particular PC: having only 4GB RAM, having no SSD and most importantly running McAfee VirusScan Enterprise as the security software. It crawls when debugging through Visual Studio and working with multiple applications at the same time. There are 4 members in my team who use similar PCs and everyone's experience has been identical, except my PC is going even further. Last Thursday, I had to run a check on the printer driver to see how much of a performance hit the feature that we had been working on had. When I first measured the printing duration of the stock drivers, it took way longer that it was supposed to. At first I thought it was a problem with the driver package as the stock driver was still in pre-alpha stage. And from this version onwards, there were some large design changes that were being incorporated which could have been the cause of the slowdown in the first place. Just to pinpoint the culprit, I checked the final release installer of the previous version of the driver which should have no performance issues. It was definitely faster than the one I was originally testing, though not by much. It was still way off the charts. Finally I decided to run the check on a colleague’s PC. To my amazement, it ran the test many times faster than mine, making my PC the suspect of the mystery.